With the Halloween game behind me, I figured I’d show off some of the miniatures used in more detail. An excellent thing about the whole Halloween game with a set deadline is that it really made me paint more than in a good long while, and now I have a solid group of townsfolk to fight off not only rampaging monsters, but pirates as well. I showed off the willage workers in an earlier post, here are some of the more well-off individuals. They were all quick paintjobs, but I’m reasonably happy with each and every one! I love this model from Front Rank Figurines. He looks really stern, and is more priestly than the average Rick. He was very easy to paint, too! I’m not too fond of painting black, so pretty happy with how his clothes turned out. 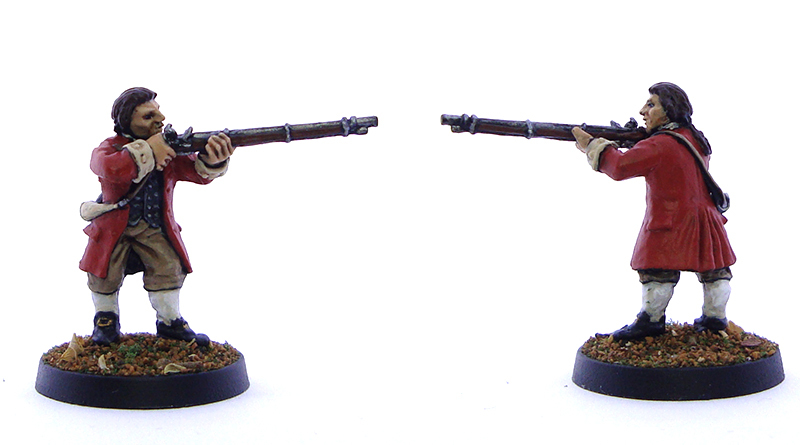 A Redoubt FIW miniature. Very, very simple paintjob with grey pants and a white shirt. 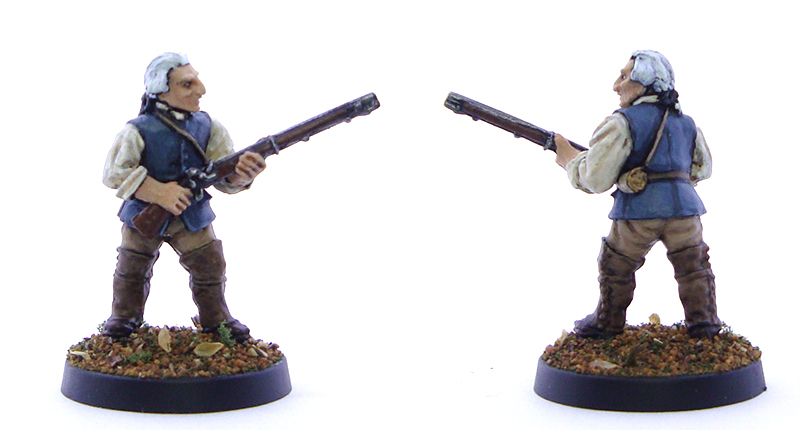 I like the pose and the lack of vest, as he looks like he’s been forced to pick up the musket at a moment’s notice. 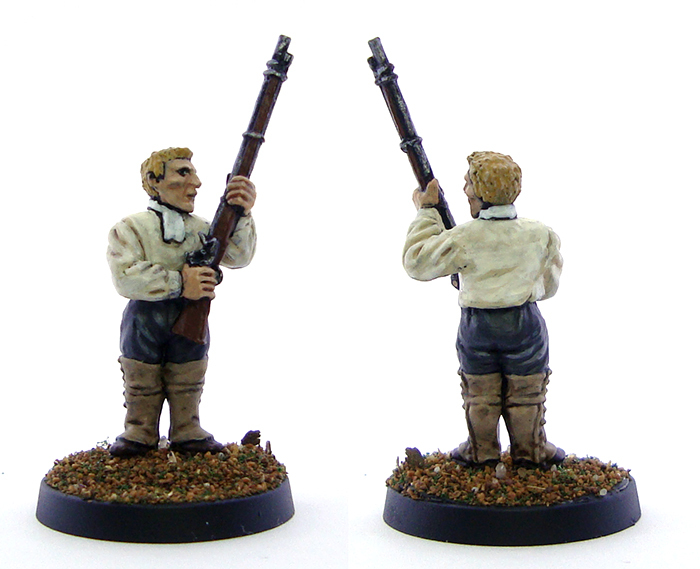 Another Redoubt mini, I love this one’s face. He has an impressive nose, and overall looks almost like a Native American. I like the pose, he looks very alert and ready for action. This is one of my favourites of the lot and another one by Redoubt. In my opinion the model’s face didn’t look Caucasian, so I decided to try something different. 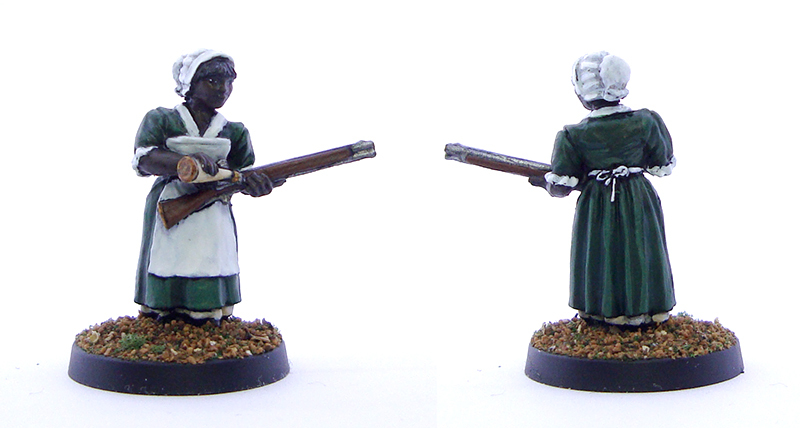 I’m really pleased with the end result, as both the skintone and the overall paint scheme turned out well. It also gave me a good chance to look into the history of black people. I love painting red, and this mini was no exception. I think the red coat turned out fine and all in all I like the combination of colours. Can’t go wrong with a combination of bone white, muted red and khaki. These minis as well as another villager bring my painting tally up to 31 for this year. Comments welcome! As I’ve recently been fiddling with the photo setup, I was wondering whether I should keep the pure white background or go back to a coloured one. Opinions? Very nice Mikko, good to have some civilians to hand, and these guys look great! 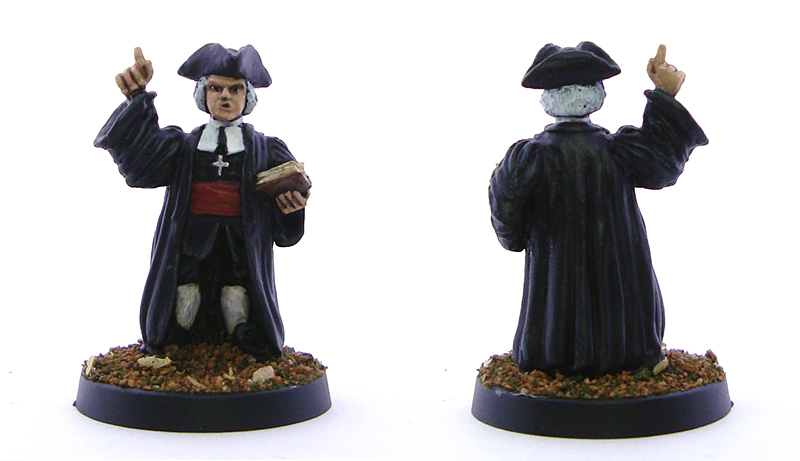 I particularly like the redcoat (I too enjoy red), and nice work on the dark skin… I’ve tried it myself, and it isn’t easy! Thanks for the comment Alex! I’ve taken a liking to painting civilians lately, and they have plenty of different uses so that helps with the motivation as well. Sounds great! I just subscribed to your feed 🙂 Speaking of narrative driven games, have you read my posts on the subject? Just search for “warpg” on the blog. I hadn’t but I have now 🙂 That’s exactly the questions I’ve neen asking myself – how to make it less about winning and more about the story/experience, yet still maintaining the wargame asthetic… I’ve also lost enjoyment with tournament style play (40k in my case), but I’m liking Rogue Trader at the moment… interesting that a step backwards in time feels like a step in the right direction!